We do still see many customer who use their regular Office 365 account for administration. A better approach is to use a second account solely for administration. There are some things that need a licence though, in particular managing Teams and SharePoint does require a licence. 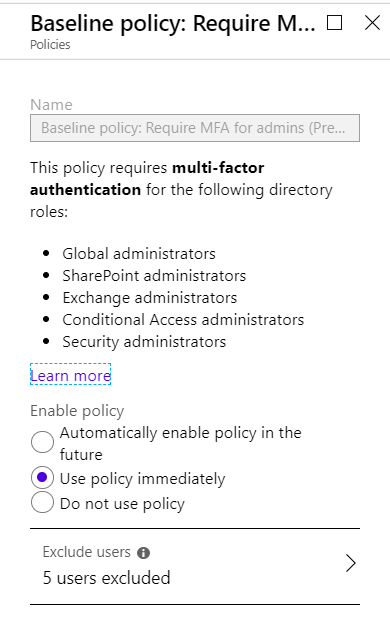 Microsoft has added a default rule to require Multi-Factor Authentication for all administrators when using the web consoles. This adds an extra barrier to make it harder for those accounts to be misused. Most people don’t use a password manager like LastPass or KeyPass, and as a result the temptation is to try to use the same password everywhere. This makes it easy for you, but unfortunately also makes it easy for the account to be hacked in one place and then used everywhere else. Ideally you should use a password manager so that you can have a different password everywhere, but even without that it is worth ensuring that your Office 365 administrative account’s password is different to anything else. Office is available on pretty much any device, including iOS, Mac, Android and Windows. It gives a good consistent experience on all of those and assuming again that you keep this patched (The number one reason people are hacked is lack of patching) it is pretty secure. Office 365 has many different ways of connecting to it, and one particular way is rarely used legitimately but is a massive honeypot for hackers. Authenticated SMTP (which also allows IMAP/POP to work with basic authentication) is on by default. There are some website names or Top Level Domains that are more likely to be suspect, e.g. .host, .cc, tk If you’re really concerned about security then on your Windows machine you have options to use things like Restricted Sites in IE (which unfortunately doesn’t let you put in entire top level domains) or a PAC file, similarly if you have an on-premises Active Directory then you can use DNS to create additional DNS zones with no records in them for any website name or top level domain that you want to prevent anyone from accessing. You could even go the other way around only allow access to sites or top level domains that you actually trust. Both of these approaches are a lot of work to maintain though, so they’re not for the fainthearted.